IF bluegrass, bush dances or good-old Australiana gets your billy boiling, then take yourself along to taste TUCKITINYA at the Phoenix club this Sunday night. Tuckitinya is part of the club's free Sunday concerts in the lounge during November, kicking off weekly at 6.30pm. Lead singer and guitarist BILL SARINA has more than 25 years experience singing songs with an 1800s and 1900s flavour. His specialty is songs by FAIRPORT CONVENTION, STEELY DAN, BUSHWACKERS and REDGUM. 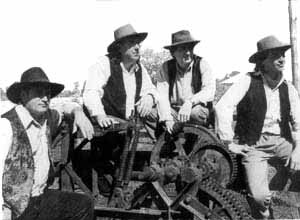 Other members of Tuckitinya are bass player STEVE SCARLETT, drummer KEVIN KIRBY, guitarist LUKE GRGICH, and mandolin player and acoustic guitarist MICK KERIN. Kerin is one of Australia's finest fiddle players, racking up road mileage with acts such as SLIM DUSTY, ANNE KIRKPATRICK, THE FLYING EMUS and GAILFORCE since turning professional in 1975. Tuckitinya also performs country songs and rock'n'roll.